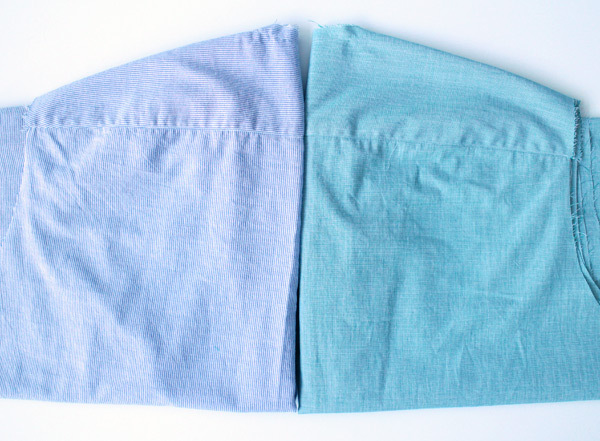 I started work on two new shirts this week, and while these colors and fabric weights are more appropriate for spring and summer, I’ve had this shirting fabric in my stash for over a year and have been dying to use it. 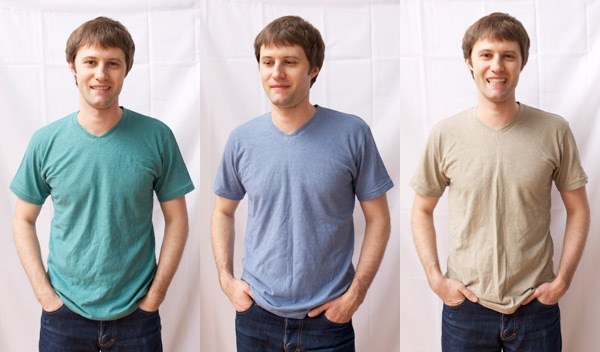 The left shirt is made out of a super light weight (almost see through) blue/white, yarn-dyed, cotton, and the shirt on the right is a green-ish/aqua chambray, also 100% cotton. Since each of my projects takes several weeks to complete (sometimes longer), I decided to start doing some mid-project updates part way through the construction process. So far I have sewn the shirt backs and fronts to the yokes, and nearly finished making the collars. I like the casual and somewhat preppy look of button down collars, so the last step for the collars is sewing the buttonholes before attaching the collars to their stands, and then the stands to the shirt necklines. Every time I start making shirts I pull out my copy of Shirtmaking by David Coffin. While I’m always looking to learn new things and try new techniques, this book is my “go to” for construction methods. Speaking of actually putting the shirt together, my focus this time around, and hopefully from here on out, is to sit back and really try to enjoy the construction process. All too often, I get carried away with simply trying to finish a project, and forget that one of the reasons I started making my own clothes is that I enjoy working with my hands and creating. If all I wanted to do was acquire a new shirt, it would be WAY easier and probably less expensive to just go buy one. There is lots of information about buttonhole attachments for old household Singers, but after a little research, I didn’t find many people talking about buttonhole options for industrial machines. Sure, there are industrial machines you can buy that do nothing but sew buttonholes, and while I would love to own one of those machines, they are expensive and take up a lot of space. These attachments have been around for a while and seem to fit just about any single needle, straight stitch, industrial sewing machine. You can adjust the number of stitches (space between stitches) that make up the buttonhole, as well as the length of the buttonhole. The stitching generally turns out more consistent than what is shown below. I may need to adjust the tension on my machine. 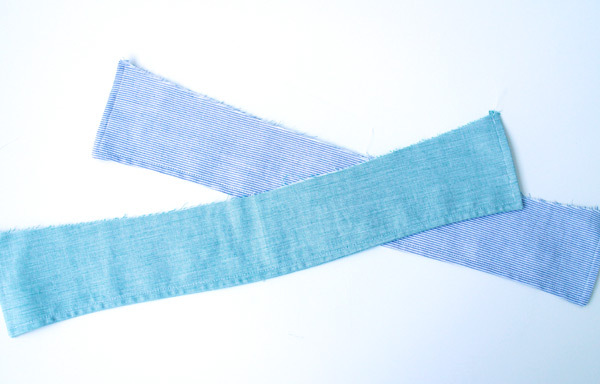 The width of the actual stitches can also be adjusted, as well as the cutting space down the center of the buttonhole. I’ve been using this in any place I need a buttonhole as I don’t like the buttonholes that my household PFAFF makes, but it isn’t perfect. The main issue is that the attachment doesn’t really do a proper “tack” at the top and bottom of the buttonhole. It does a little “side stitch thingy” before stitching each long side of the hole, and I’m not quite sure how this will hold up overtime. I also wish that the attachment could create a keyhole style buttonhole, but it can only do the standard style hole. My last criticism is that while the attachment can be adjusted to create short and long buttonholes, the longest it can go is around 1″ or 7/8″. For large waistband buttons, I wish it could go just a little bit longer. Overall though, it gets the job done, and is fairly reliable. I’ve used it on a couple of shirts, and the last two or three pairs of pants I’ve made and all of the buttonholes are still in good condition. For anyone with a basic straight stitch industrial sewing machine, this might be an attachment you want to look into, just to have another option for those pesky buttonholes. What we’ve got here…is a giant indigo vat. Isn’t it beautiful? I’d love to tell you that I’ve started dyeing my own denim, and that the above indigo vat is mine, but I have to confess that it isn’t. This pot of bubbly indigo goodness belongs to Drew from DIY Vat. Earlier this year Drew got in touch about doing a collaboration project. He offered to send me some natural colored selvedge denim that he would overdye in his indigo vat, and I would get to make something for myself with the overdyed denim. Pretty awesome deal right? How many opportunities do you have to get to work with custom hand dyed fabric? I’ve developed a love for indigo dyed garments and fabrics since I started working with denim, which goes back to the beginning of the blog. 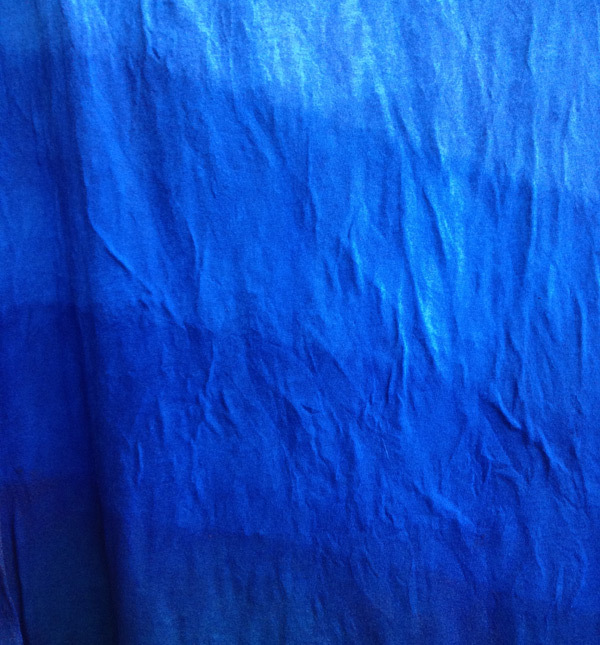 Although I’ve never worked with indigo dye, I’m fascinated with the fabric dyeing process in general. So obviously I said yes to Drew’s generous offer and I am really excited about the collaboration. He is still dyeing the denim, but offered to do a little interview explaining the process, indigo, and dye vats. Taylor: Could you tell us a little about yourself and your blog? Drew: I’m a father of two and I live with my wife in Topanga Canyon, CA. I teach at a local university and I work as an interpreter in the Los Angeles area. DIY Vat is not focused on one thing exclusively. A little bit style blog, little bit daddy blog, little bit maker blog. I also occasionally get on my soapbox about the virtues of knowing who makes your clothes and how those workers are treated — but I try not to be too self righteous about it. Taylor: What inspired you to start dyeing with indigo? Drew: I had read quite a lot about the process around the time my obsession with jeans began. When my wife and I were getting married we did a lot of things ourselves including the invitations. We started a little vat in our back yard and dyed a bunch of watercolor paper — watching the oxidization process fascinated us. I started playing around with the paper, trying a bunch of different techniques and marveling at the results. We’ve had a vat going since then. Taylor: What exactly is a dye vat? Drew: In essence, it’s a vat of deoxygenated water with the PH altered a little. 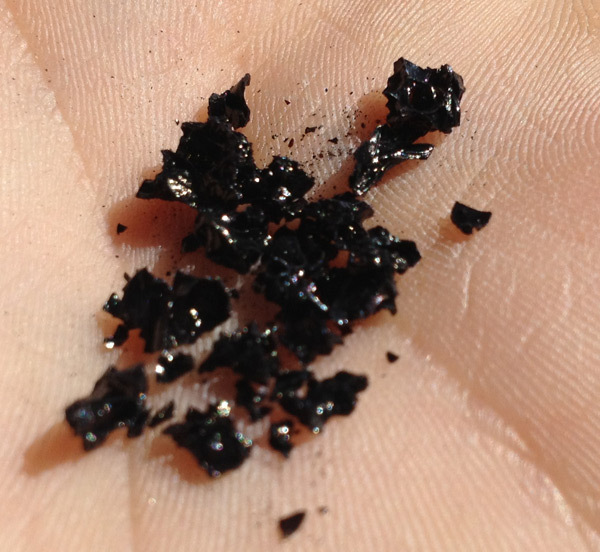 Under these conditions, the pigment undergoes some molecular changes that makes it cling to organic material. There is also quite a lot of history, folklore, and cultural significance behind indigo dyeing. I make absolutely no claim to be an expert on the topic — much of what I know I’ve learned from the book Indigo: From Egyptian Mummies to Blue Jeans by Jenny Balfour-Paul. Taylor: Are there different types of indigo? Drew: Yes! You can find the pigment in a handful of plants that grow all around the world — the shade of blue you can achieve from this natural indigo depends on the species. 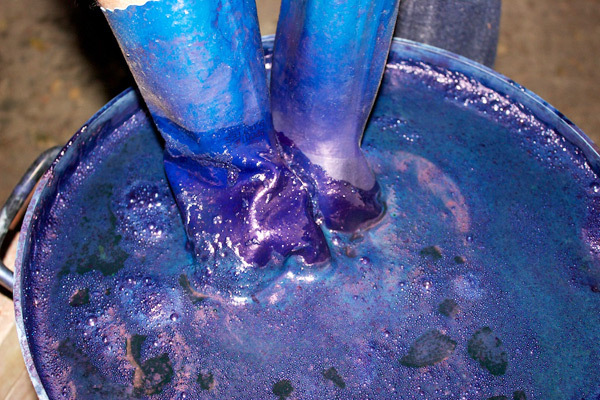 Most things we see that are indigo dyed are made with synthetic indigo. Synthesized in a lab, it is chemically purer than what you can get strictly from harvesting from nature. It’s like the Walter White extra pure blue meth, but for making jeans. Natural indigo, as you might expect, has the higher status of the two. Taylor: Could you briefly describe the dyeing process? Drew: If you’re using natural dye, the process can take months. Growing and harvesting the plants and composting their leaves is one thing, but the vat has to ferment for a while before the indigo will take to anything. I’ve only ever used synthetic indigo so the natural process eludes me, but I imagine there are some parallels with home brewing. 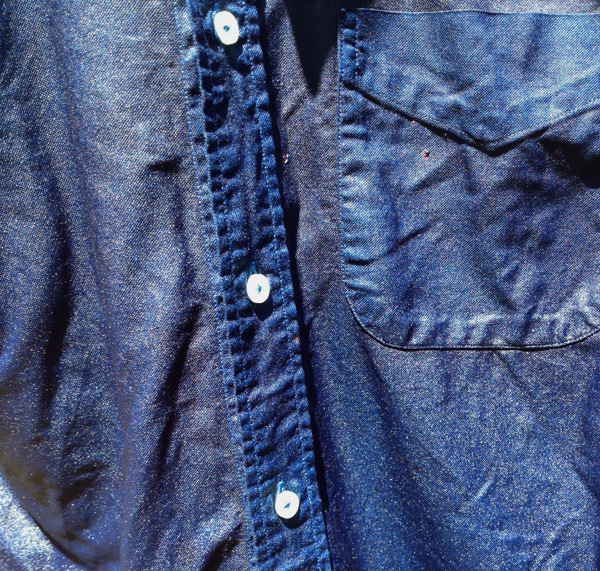 Synthetic indigo comes in a crystalized form which dissolves more readily. All you need is a large enough container full of warm water and a kit you can get at many art supply stores. Janome makes a box kit that can have you up and running in just a few hours. Once it’s ready, the basic technique is to get your fabric wet, wring out any excess water, and put it in the vat. 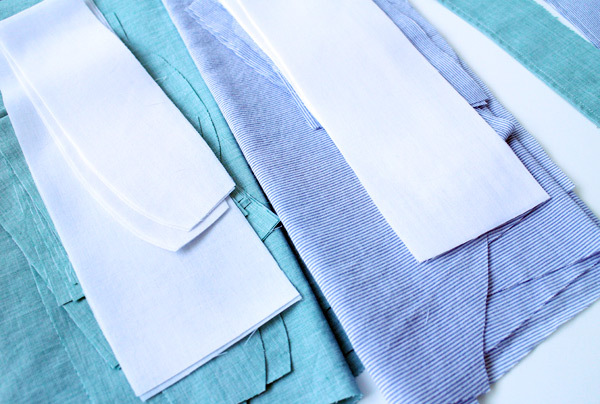 The next steps require a little more finesse — after you remove the fabric, you have to hang it open and make sure there are no folds or creases. Anywhere that doesn’t touch air won’t oxidize well and, thus, wont turn as blue as it can. Taylor: What are your future goals and plans for your blog and dyeing projects? Drew: My goals for the blog are not grand. I committed to a three day a week posting schedule a few months ago and have done well. The challenge now is to make sure the quality doesn’t drop. I also want to network with other bloggers with similar interests. I’d like to collaborate with others on projects like the one you and I are working on. I’m also kicking around the idea of a clothing swap project. 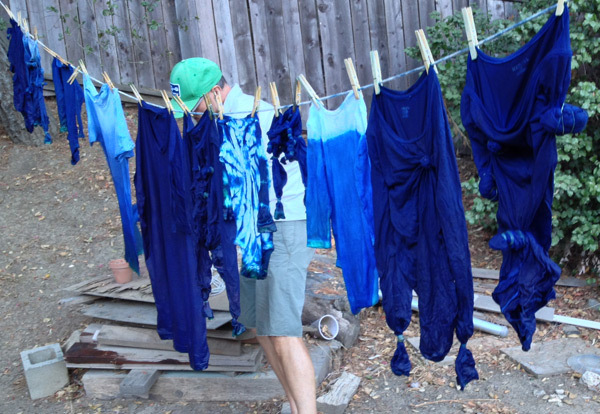 As for dyeing, we’re going strong with indigo. For my wife’s birthday we’re inviting some friends and their children over for a dye party. I am, however, itching to experiment with other natural dyes — weld specifically, so I can make Lincoln Green (interesting read here). All images provided by Drew. This backpack is roughly the same dimensions as the first pack I posted earlier this summer, but I changed the pattern and construction to allow for some different options for pockets and shape. Carry-on size, fits in overhead bin storage, and under the seat on airplanes. I am really happy with the way this turned out. Before sewing a single stitch, I tried to think through the entire construction process. My goal was to keep the construction as simple as possible: no button holes, no basting, no pinning, no changing sewing machine feet, and no pressing. I wanted simple, efficient, no nonsense sewing, and I was able to do just that. Obviously that approach won’t work for every project, and I’m certainly not knocking basting or pressing when they are necessary, but I tried to factor the need for those practices into the design to eliminate their necessity from the beginning. 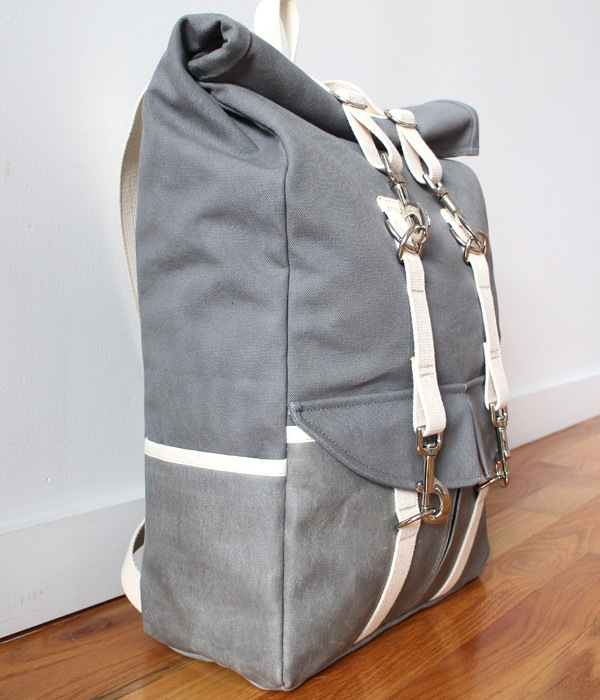 I want to get back to making clothing soon, but right now I’m having too much fun with backpacks! I have a thing for backpacks. 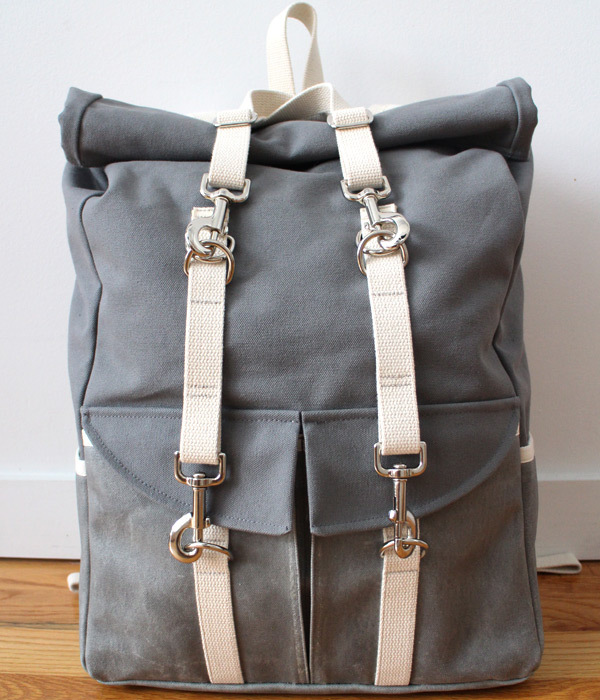 Actually, I like all sorts of bags as long as they are useful and serve a purpose. Maybe it’s their utility, maybe there is some nostalgic, deep rooted tie to my school days. After all, a properly packed backpack that had the right books, homework, and lunch for the day ahead meant the difference between having a great day and a crummy day at school. The backpack in many ways is a survival tool, and I love that there are seemingly endless variations on the same concept. As a result of my obsession, I’ve decided to spend some time working out the design for a new pack. 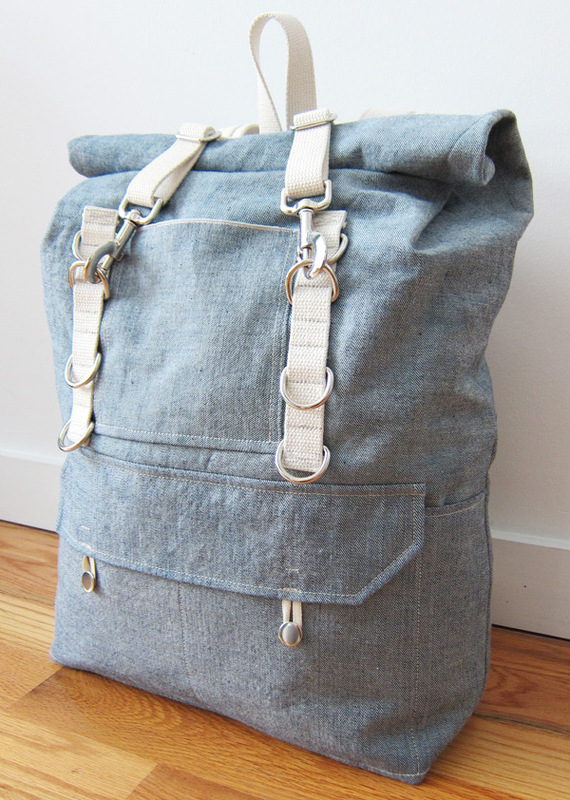 I had a great time making my waxed canvas backpack a while back, but as always, there is room for improvement. 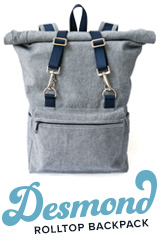 This is a basic roll top design made with reverse denim. I had lots of denim scraps lying around, which is really the only reason I used denim for this prototype. The next version will probably be made with heavy canvas instead. 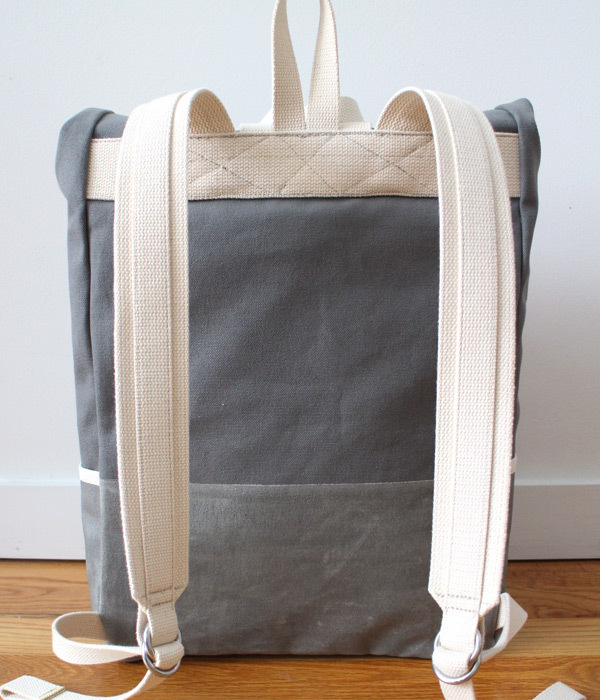 It features several exterior pockets as well as a few simple interior pockets for small items. 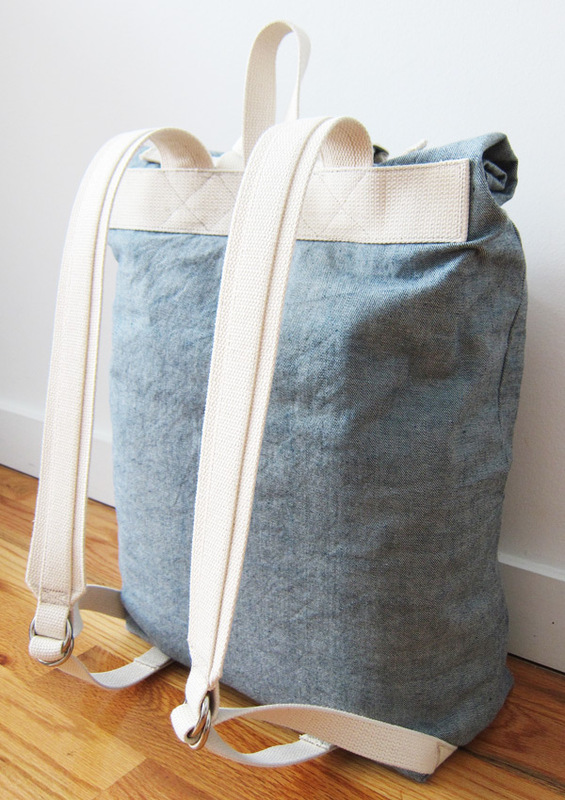 The backpack is fully lined with another layer of reverse denim. All of the webbing is cotton. Most of the pockets need to be re-evaluated. The loop/button closure on the outside isn’t ideal, but I was simply using supplies and materials that I had on hand for this first version. There are SO many things to think about in terms of webbing placement, weight distribution, finishing seams, pocket closures, etc. I actually love this challenge, and have already starting making plans for the next version. 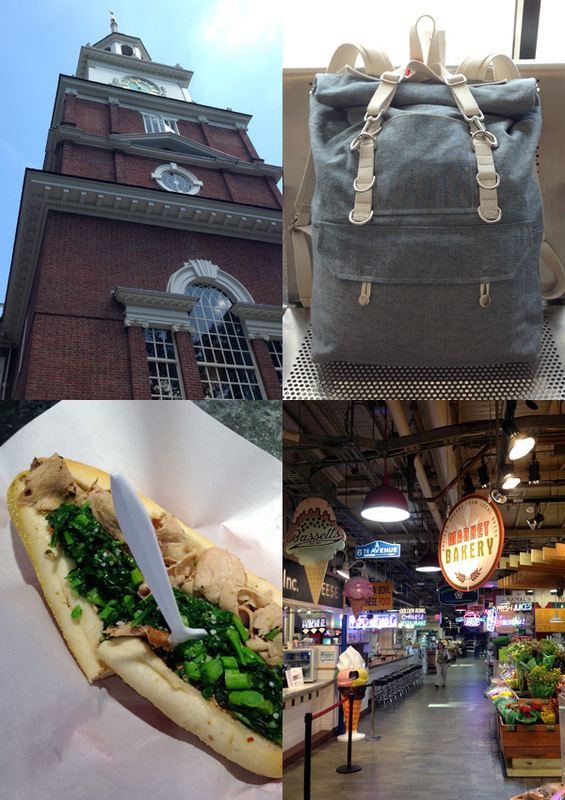 I recently had a chance to “field test” the pack on a quick trip to Philadelphia and the surrounding area. It makes a great carry-on, and has enough space for three, possibly four nights worth of clothing depending on how you pack. A few iPhone shots from the road. The upper left is Independence Hall where the Declaration of Independence was signed. I truly enjoyed seeing this historic building and being in the same room where history was made. I’ve never seen any other fabric elicit the type of passion and dedication from people that denim does. There are entire websites, online forums, and numerous books all dedicated to denim. New boutique denim brands seem to appear out of nowhere on a monthly basis. Even though I haven’t made anything with denim in a while, it is still by far my favorite fabric to work with, and is really what got me interested in learning how to make my own clothes. My interest in making shirts, chinos, backpacks, etc. all started with a pair of jeans. 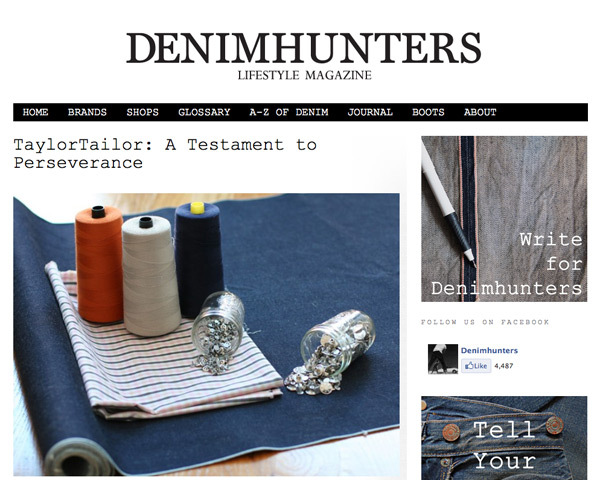 So I was thrilled when Matt Wilson, from the online lifestyle magazine Denim Hunters, contacted me and wanted to do an interview about my sewing projects and work with denim. The magazine focuses on denim and jeans, but also has articles about other well crafted products, and denim related events and stores. Matt did a wonderful job with the piece. You can read the interview here. While summer in Tennessee can be beautiful, the weather is usually hot, humid, and sticky. When I first moved here from a drier climate about six years ago, I used to joke that I needed a snorkel to go outside. The air was that thick, or so it seemed to me at the time. My body has acclimated somewhat, but when the temperature reaches 70 degrees I start sweating. At 90 degrees I am ready to pass out. 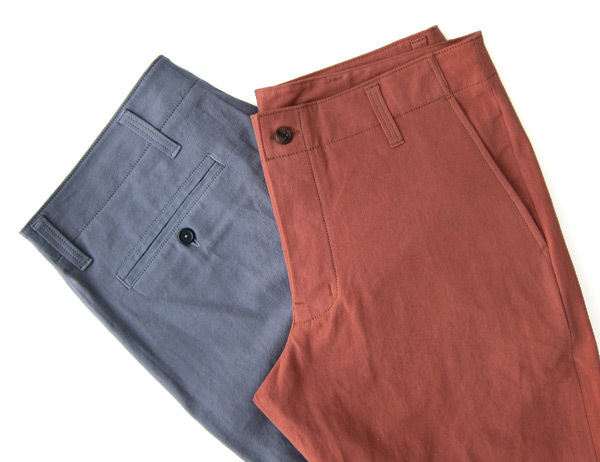 In an effort to stay cool during the summer months, I decided to make some lightweight spring/summer pants, or pantaloons, chinos, trousers, breeches, slacks…whatever you want to call them. On a side note, I think all the different names we have for “pants” are sort of funny. I’m sure there are some historical and cultural reasons behind the different words, and I bet that there are people willing to argue the finer points that distinguish pantaloons from trousers. 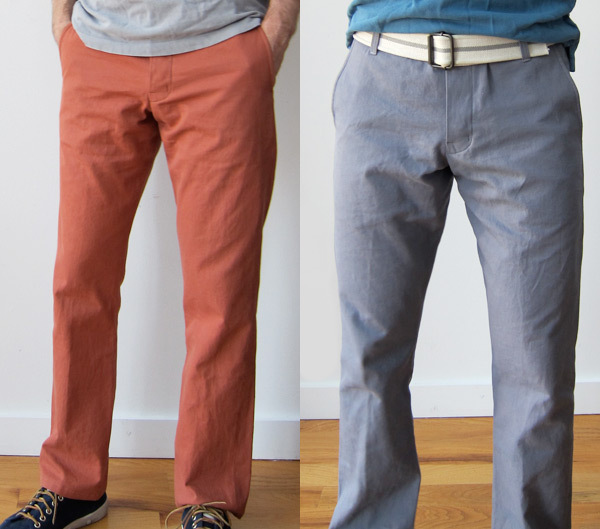 If you are a pants expert, let me know. 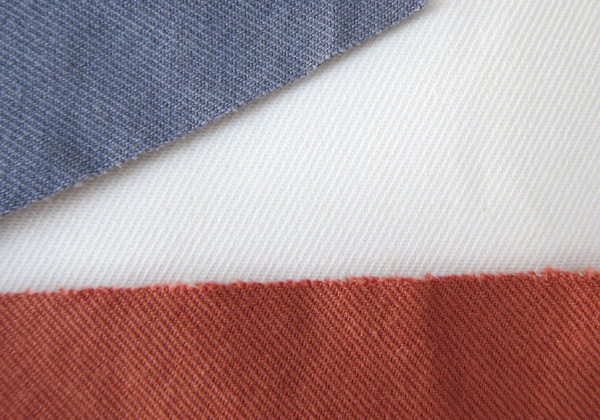 I found a really nice summer weight twill for the project. The fabric, which was originally off-white, is an organic cotton/hemp blend. Like my t-shirts, I decided to dye it for some variety. This time around though, I dyed the fabric first before cutting and sewing, rather than the completed garment. The dyeing process is always a gamble as far as the final color goes, but I am happy with the way these colors turned out. The main change I made to my pattern was adding a cut-on waistband. So rather than a separate waistband piece, I extended my pattern at the top of my pants by the height of my original waistband. Then I finished it off with a facing that was sewn to the top, folded to the inside, and top-stitched down. This didn’t change the fit at all, but I wanted to try and see if the construction was a little easier than attaching a regular waistband. I’m not completely sure which method is actually easier. They both have some tricky areas, but I think the cut-on version might be a little faster. My plan is to work on some basic “polo” shirts next. I already have the fabric, but need to work on the pattern and choose some dye colors. 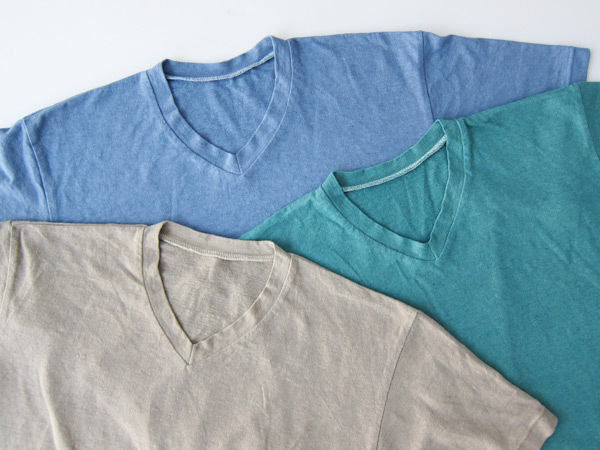 These shirts are made from an organic cotton/hemp blend jersey, which gives them a slightly “heathered” look, and adds a little bit of visual texture. Yes, there is hemp in this fabric. No, I can’t smoke my t-shirts. I tried. It doesn’t work. Just kidding (kidding about trying to smoke them of course!). There are lots of misconceptions about hemp, and I didn’t intend on bringing this up, but I had several comments from people along those lines while making these shirts, and feel like I need to say something about it. Put simply, industrial hemp, the plant grown for its fibers, which can be used for fabric, yarn, rope, webbing, etc., is different from the stuff that people smoke, or bake with, or….you get the idea. The plant produces a really strong fiber that can be made into a wide variety of textile products, and fortunately for me, it is relatively easy to dye. I have a ridiculously hard time finding fabric for my projects, and I am always looking for the perfect combination: the right fabric for the garment, the right color, and the right price. So when I found this organic cotton/hemp blend jersey and it was reasonably priced, I decided to buy some. The only problem was that originally, the fabric was sort of an off white yellow-ish hue, which isn’t really my thing. Although I enjoy the dying process, it does consume a lot of water, and I’m guessing that the dye and fixative aren’t the best thing for the envrionment. These two concerns probably cancel out any “eco-friendly” benefits of using organic cotton and hemp. My original plan was to use natural dyes, but it appears that they aren’t always more environmentally friendly, and you still have to use harsh chemicals to make them set. The fit isn’t quite perfect, but it will work for now. I might want to revisit the pattern and see if I can clear up some of the bunching in the arm pit area. I based the pattern off of a t-shirt I wear all the time, and after examining several ready to wear t-shirts I have, they all bunch like this on me in the under arm/chest area. While technically a V-Neck, the “V” is so shallow that these fit more like a crew neck t-shirt, which is fine by me. I wanted the center front to come to a point, but didn’t want a plunging neckline. Arms can be so awkward. Thankfully my jeans have pockets. Also, I’m awful at posing for photos. This was my first time sewing with knits, and it really wasn’t as difficult as I expected it to be. I used my serger for all of the construction, but used a zig zag stitch on a regular sewing machine to baste the neckband in place before serging, and a double needle on the same machine to top-stitch the sleeve and bottom hems. I completed the shirts (except for the hems) first before dying them. Since polyester thread does not absorb the type of dye I used, I saved any top-stitching for after the dying process to make matching the thread color easier. I pretty much stick to what I think of as basic wardrobe staples for all of my projects. 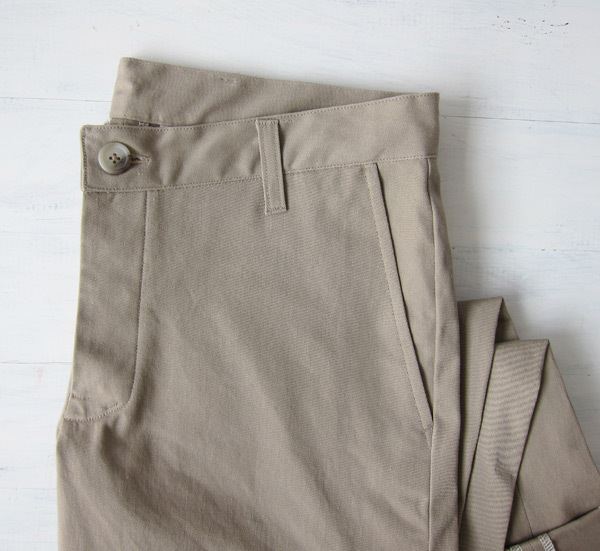 Other than jeans, it doesn’t get any more basic than a pair of khaki chinos. 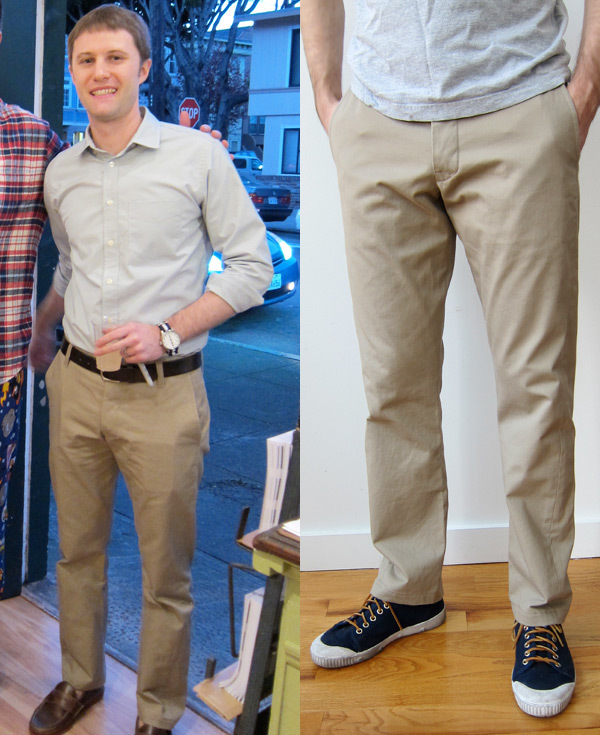 Creating a closet full of garments that work together, that can be mixed and matched, has been my mission from the very beginning; and khakis go with just about everything I own. Most of my projects so far have been men’s shirts and pants, and going forward (fair warning), you can probably expect a lot more posts about shirts and pants. Because that’s what I wear. Shirts and pants. I realize that this approach might be a little on the boring side, especially for those who enjoy bright colors and loud prints, but I spend too much time on each piece of clothing for any one item to not work with at least part of my wardrobe. Plus, I’m not sure if I can really pull off bright and loud the way some people can. I love the versatility. They can be dressed up a little, or made to look more casual if I choose. The picture on the left was taken in San Francisco at an amazing little bookstore called Omnivore Books that sells nothing but cookbooks. How cool is that? Wall-to-wall cookbooks. My wife Lindsay and I were there promoting our book in February. This isn’t my first time making this style of pant. While my first pair was fine at the time, I wanted to make a few improvements. In the process of trying to alter the pattern, I ended up with some unexpected leg twist. I’m not completely sure if the twist is due to cutting out the pattern off grain a little bit, or if my pattern adjustments simply altered the fit in ways I didn’t realize. The next time I make these I have to fix the twist at the side seams of course, but I’m also going to experiment with a cut-on waistband and some really light weight fabric. I need some pants that can be comfortably worn in the summer in Tennessee without feeling like I’m going to melt, or dye, or sweat to death. Speaking of warm weather clothes, my plan is to tackle t-shirts next. I’ve been holding on to this piece of shirting fabric for nearly a year and finally got around to using it. 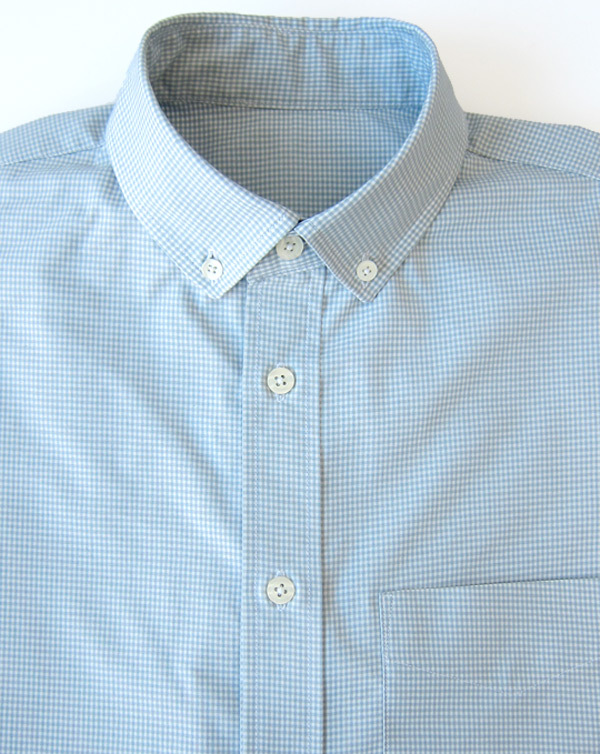 The pattern and fit is nearly identical to the last shirt I finished, which was made from a light blue oxford cloth. 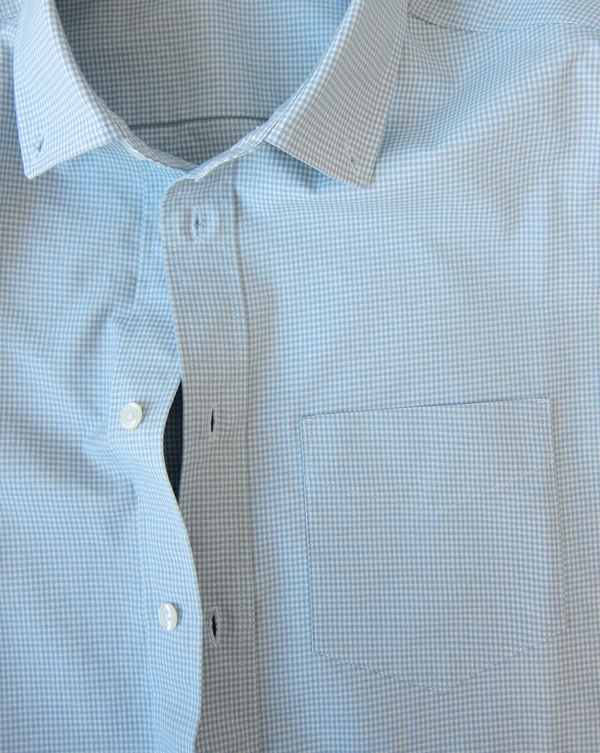 This fabric is a small check white and gray gingham that is tightly woven and very crisp. 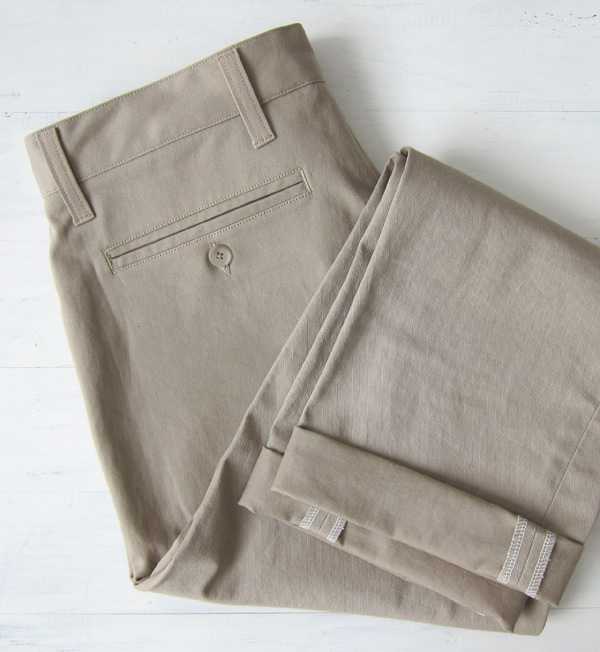 The weight is a little heavier than I would prefer (I find that I like lighter and lighter weight shirtings regardless of season), but I’m sure it will soften with repeated washings. The only pattern adjustment I made was to the length of the collar. I actually need to trim it a little more because it is overlapping just a little too much at center front. The only time this would be a problem is if I want to wear a tie, which happens once, maybe twice a year. So I could have posed in my living room for a proper fit picture, but I tend to like candid shots better even if they are blurry, grainy, low light iPhone pictures. 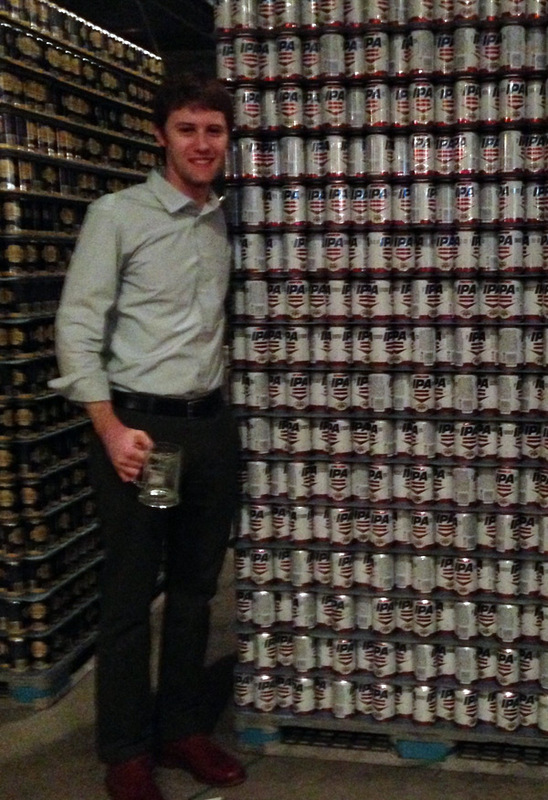 This is me hanging out in between giant pallets of beer at Good People Brewing in Birmingham, AL. If you are ever in the Birmingham area and like beer, definitely make a stop at Good People. I highly recommend the Snake Handler double IPA. Speaking of beer, I happen to do a little brewing from time to time. I’ve decided to create a section on the blog for all of my brewing adventures. This is mostly a way for me to keep track of my brew sessions, recipes, and tasting notes, but for anyone who is interested in small batch all-grain brewing, there is a link in top menu. I realize that a lot of people have zero interest in beer on a sewing/clothing blog, so I’ll try to keep the beer related posts on this separate page.